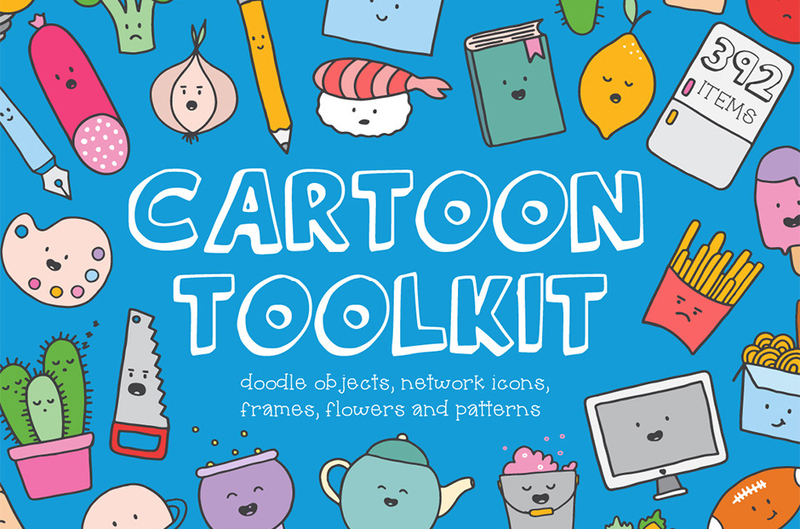 Cartoon Toolkit: Over 210 Objects With 35 Emotions Ready To Use! Each element happy or sad, angry or funny, surprised or disappointed has been made for your design fun in this cartoon toolkit! Choose emotions for any item. These tools will help you create your own logos and branding. Do you have a cafe with burgers or sushi? Maybe you need to create a corporate identity for a cleaning company? Or you have a vegetable shop or you want to decorate your blog with icons? Use patterns that are ready to use for your branding or different elements. Create your designs using 390 different tools. Software compatibility: Adobe Illustrator CS3 and newer. .EPS files will work with a variety of programs such as Adobe Photoshop or Illustrator, Sketch, InkScape, Affinity, Corel Draw, etc. .JPG and .PNG files will work with most graphic software. Software compatibility:Adobe Illustrator CS3 and newer. .EPS files will work with a variety of programs such as Adobe Photoshop or Illustrator, Sketch, InkScape, Affinity, Corel Draw, etc. .JPG and .PNG files will work with most graphic software. File size is approx 170.7MB (289.2MB unzipped), offered as a single download.